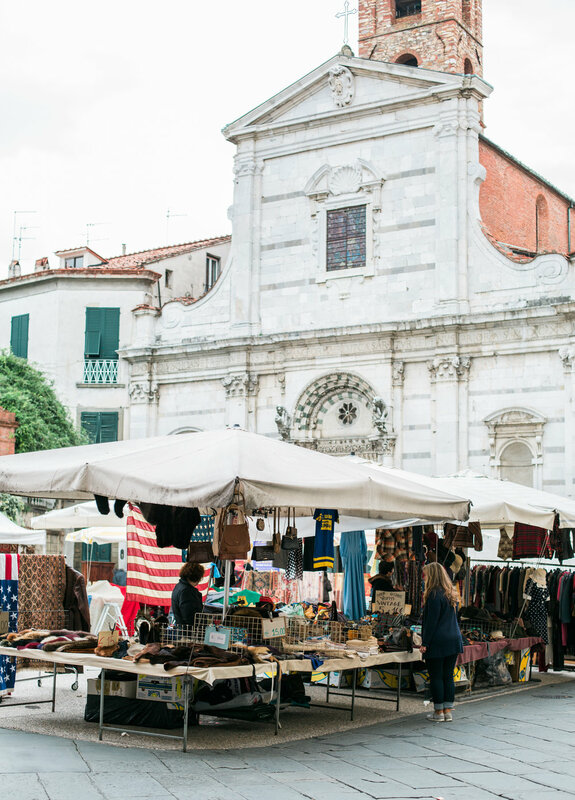 Our stay at Valdirose happened to coincide with the monthly antique market in Lucca. And being that we both love a great flea market we were all too happy to make a day of it! After we found parking we made our way to the main square to begin our hunt. The market has hundreds of dealers with stalls spilling over from the square on to the side streets and alleyways. The backdrop of Lucca's ancient architecture made for an incredibly memorable experience. For hours we strolled among the stalls searching for treasures, enjoying the local chatter and bargaining being discussed in Italian. All on friendly terms, of course. One thing I've noticed about European vs American culture is that dogs seem to be welcome everywhere. Which I love! I've seen dogs at markets, on busy city streets, at local cafes and coffee shops, even in larger shopping centers all with an air of ease in their surroundings. It makes me want to bring our rescue pup Liberty along for the ride more often. We happened to run across an antique marble basin nearly identical to the one we used in my studio bathroom. It was 250 euro in case you're wondering. I also adored that bamboo chair! Too bad it wouldn't fit in my backpack carry-on. My husband was obsessing over all the unique bikes. I think he plans on making one someday because he asked me to take a photo of nearly all of them. I have to admit this powder blue one parked in front of my favorite linen vendor was pretty cute. I ended up buying a set of six antique linen napkins here. Now I just need to plan a little party to use them. Thanks for dropping by the blog today. I know my posts are few and far between and I wanted you to know I appreciate you taking time to spend a few minutes here with me. Goodness knows I have a volume of stuff to talk about: travels, work, interior decorating going on at Grove House, and a slew of other projects. Hopefully I can get my rear in gear and knock out some posts!